With just a week to go before the first game, in typical Nick Saban fashion, he has declared that there is no depth chart at Alabama. Only this time, it's not because he doesn't want to disclose it, it's more like he doesn't know who will wind up with the starting jobs and who will be the backups. And that's a good thing in this case, because it isn't that some are under-performing, it's that so many are performing so well that it's simply hard to chose. The depth in this years team is simply staggering. 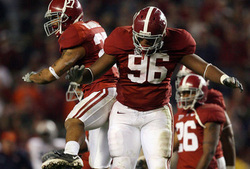 Only Dont'a Hightower and Courtney Upshaw are guaranteed a starting job. There are seven players in the mix right now to fill the other positions. 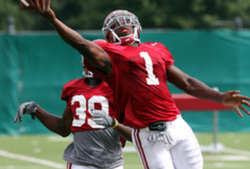 Jerrell Harris looks like the man who may the starting nod in a nickel package and fill the inside role as top back up. He is so incredibly athletic that he can cover like a corner and in passing situation and has shown the grasp of the cover aspects of that position a little better than Nico Johnson or Chris Jordan for that Will slot. He has had some time with the ones in practice and when Hightower moves to the outside, he seems comfortable in the middle. Many thought he might lock down the Sam Position, but Chavis Williams worked hard, bulked up even more and continues to impress the coaches with a lot of reps there and may finally live up to the potential he's always had. So it could be Hightower and Chris Jordan in the middle, Upshaw and Chavis Williams on the outside. That would leave Harris as the "starter" in the nickel package and maybe Ed Stinson in "rabbit rusher" role. And since Saban has moved them around so much in practice, many players could fill lots of different spots without much of a drop off at all. It's nice to see DeMarcus Milliner prancing around in practice without a black no contact jersey on again, but his absence for the last week or so dropped him in the depth chart, to possibly playing most in the nickel and dime positions as a backup for now. With him out, Nick Perry and Jarrick Williams have been working the money position and that battle is still up in the air. Both have looked good. That money position is a combination of corner and safety so both could be great backups at just about any spot. It looks like Mark Barron and Dre Kirkpatrick have locked down their jobs and safety and corner back respectively, but the rest are up for grabs. 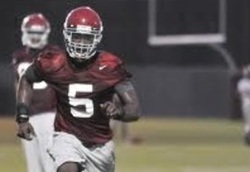 Phelon Jones is looking like the other nickel package man if he doesn't lock down another role as corner. BJ Scott looks like he might make a claim as the other corner in the base defense, but he's being pushed hard by at least three other players for that job. For the other safety slot, Robert Lester was thought to have that locked down by now, but Will Lowery has been pushing him hard and getting a lot of time with the first unit as well as Lester. Once DeQuan Menzie gets healthy, he may try and lock down the star position, but for now, when they go to nickel and dime packages, Barron slides into that role and Lester and Lowery both play the safety roles. That position was run by two last year, and by all indications may be this year as well. Both Josh Chapman and Kerry Murphy do a lot of swapping with the first team, but Chapman may very well have the final nod at that spot. I believe that Nick Saban knows more than he's telling as Marcell Dareus has had almost all the reps at his end position and that would only indicate to me that Nick Saban must know he's going to be cleared by game time by the NCAA. At the other end, Damion Square was last year's starter until an injury, and with him at 100 per cent right now, most thought he would nail down the job again this year. However Luther Davis has been getting a lot of reps with the number ones and that position may not be settled for a while. The good news is however, that both look great when they get the chance to shine and they may wind up sharing time as the season goes on to keep a fresh end pounding on some poor lineman the whole game. Just about the only position that's still open of offense is the right tackle position. Though D.J. Fluker has been mowing them down on running plays, he still has some footwork problems on pass blocking and that has caused the coaches to start looking a little more at moving Barett Jones to right tackle. Again, instead of being a worry, it's a blessing for the Alabama fans that Nick Saban has so much depth that he can put the nation's number one tackle prospect on notice after a red shirt year that he still may not be ready to start. The rest of the offense is pretty well set for starters, but there are wars still raging for back up players. With So many players having a legitimate shot at a starting job at this point in the year is a testament to the talent that Nick Saban and his staff have brought to Alabama. The fact that these same wars will rage next year should scare the scheduled opponents. Even though they are the preseason number one team in the nation, they are still one of the youngest teams in the top 20, with this talent and level of competition they may be a contender for a while.